By Kenjiro Hata. Released in Japan as “Hayate no Gotoku!” by Shogakukan, serialization ongoing in the magazine Shonen Sunday. Released in North America by Viz. Translated by John Werry. Hayate Ayasaki is a very good butler. That’s pretty much the premise of the entire manga. As a butler, he’s smooth, always knows what to do, and provides the girls he waits on with whatever they desire. I wouldn’t go so far as to say that’s why they fell for him, as in fact each of them has different, non-butler reasons for that. But it’s striking if only because in Hayate’s other role as a harem protagonist in a romantic comedy manga, he’s absolutely terrible. He’s very good in terms of what Hata needs to convey in the writing. But much of Hayate’s so-called “bad luck” can also be put down to wishy-washiness, cowardice, and the complete inability to understand the trembling of a pure maiden’s heart. It’s why we’re 29 volumes in and disasters keep piling up for him. 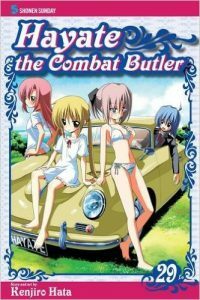 The disaster doesn’t happen in this particular volume, but we know that at some point in the near future, Ruka is going to discover that Hayate is a guy, and there will be hell to pay. Of course, this is played for max comedy – every time he thinks he can confess, she says the one thing that stops him from doing so – but it’s still a case where you want to put your face in your hands. She also, by the way, is trying to earn a large pile of cash to get herself out of debt because her parents are suckers – a similarity Hayate is quick to catch on to. It’s not the first time Hata has done this – Hina, too, has lost her birth parents due to “we abandoned you because of our debt” – but that at least had the excuse that it was part of his original outline for the series. Ruka’s past seems more like overegging the pudding. The rest of the volume is for the most part a series of one-shots focusing on the cast, which I think Hata enjoys best. Alice talks with Hayate, and there’s some discussion of who she is, but not much – she says she’s lost her memories of Athena, but clearly knows she *is* Athena in some way. Also, don’t let dogs eat chocolate. Wataru and Saki also have money troubles, and even Sayaka literally loaning them a giant pile of money doesn’t help, particularly when Hayate gets involved. Speaking of Sayaka, she’s rather annoyed to find that the position of “Nagi’s (relatively) sane best friend) has been stolen by Chiharu, particularly since Chiharu is HER OWN MAID. As for Maria, well, she gets nothing to do except pose naked for the camera as pre fanservice, something Hata lampshades almost immediately. These are all pretty good chapters, not hilarious but quite amusing. In the end, though, the plot will have to advance soon. Ruka will find out Hayate’s gender. Athena will eventually stop being a girl. And, one assumes, the manga will end. It’s coming to a close in Japan, but Viz still has a long way to go. See you in the fall for another volume.